Nicholas Mayo lives with sustainable technologies on a daily basis. He is skilled at quickly identifying areas in and around your home that could increase comfort and reduce operating costs, making your home more sustainable. Canberra’s Sustainable House offers a range of sustainability assessments on a fee for service basis. If you are thinking about retrofitting or renovating sustainably, think Canberra’s Sustainable House. Our assessment service provides honest and effective insight designed to guide you through the mine fields of building a sustainable house. Canberra’s Sustainable House has a demonstrated capacity to achieve a high quality sustainable home. We know how to navigate and work with all the professionals that operate in the building industry. To avoid disappointment we recommend you contact us even if is just for some basic advise. Engaging us to complete an initial assessment is a good place to start. Essential for people considering renovating or retrofitting their home or business for sustainability. A Sustainability Assessment is the first step in the process towards a sustainable home and business. Canberra’s Sustainable House has the knowledge and experience to transform your building, whether home or business into a comfortable low energy, low water consuming entity. With enormous savings to be made in water and energy consumption in Australian homes and offices, shouldn’t you find out what can be saved?. Nicholas Mayo will identify key areas for action, provide direction and assist you in setting cost reduction targets. Canberra’s Sustainable House will help you move into the low carbon future. Book a Canberra’s Sustainable House, ‘Sustainability Assessment‘. Discover how comfortable and cheap your home and office should be to run. Tailored for the Smart House Hunter seeking insight into the Sustainability Potential of their prospective new home. The intent of this service is to frankly and honestly inform purchasers and cut through the hype. A Canberra’s Sustainable House ‘Reality Assessment’, puts REAL back in Real Estate. Be informed about the purchase of your first home or next investment property so you avoid an investment that costs your the earth. 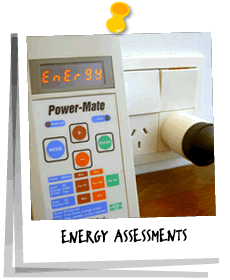 This custom assessment service goes beyond the compulsory Energy Efficiency Ratings (EER) that is a legal requirment for sale of houses in Canberra. This is a holistic package addressing your lifestyle, including aspirations in the areas of garden, water use and beyond.